If you’ve never travelled by bus in a developing country, you’re in for an eye-opening experience. Setting aside aspects like safety (seatbelts being pretty much unheard of) and toilet stops (this being the operative word for the glamorous task of squatting behind said bus), the most vivid memory I have of my South American journeys is the arrival the indomitable food hawkers. As any given bus wound its way through the mountains, pit stops would be made at the dusty villages which line the roads. As soon as the wheels ground to a halt, a variety of hawkers would swarm on board, shouting for attention and touting their wares. Great big bags of greasy homemade crisps, sticky tamales, salty white cheese on a stick and all the usual suspects in terms of chocolate and sweets would almost always make an appearance: the snacks of choice for the tired and weary traveller. Given the heavy, salty nature of most of what was on offer, when a hawker appeared selling fresh fruit on one particularly arduous journey, I couldn’t resist picking out a giant, juicy mango. Rather than being served on a stick and squeezed with lime as is sometimes the case in South America, this specimen was still intact. With a pen knife in my pocket (originally bought for the purpose of all sorts of outdoor adventure, now consigned to the slightly less life-saving role of fruit eating implement), I decided to give it a go. My mango provided about ten minutes of sheer eating pleasure. If you’ve grown up in England where the majority of mangoes are about as tasty as a turnip, the joy of eating tropical fruit that is actually ripe is unparalleled. The mango melted in my mouth, sticky juice dribbled everywhere and I couldn’t have been happier . . . Until the bus took off for the longest leg of the journey and I realized it would be several hours before said sticky juice could be removed from my now slightly sickly sweet smelling face and fingers. For a less rustic but equally enjoyable mango eating experience, I’d suggest this simple breakfast bowl. Anyone who follows me on Twitter will know my slight obsession with bircher muesli and I love experimenting with different grains. While oat, buckwheat, quinoa and rye flakes are all on regular rotation, I’d not tried anything of a completely different texture until this wild rice variation, and it’s a lovely new addition. The combination of rice, coconut and mango is one that is often seen in desserts but is equally delicious for breakfast. Substitute sticky with wild rice, cut out the sugar and stir through with yoghurt and it’s actually pretty nutritious too. 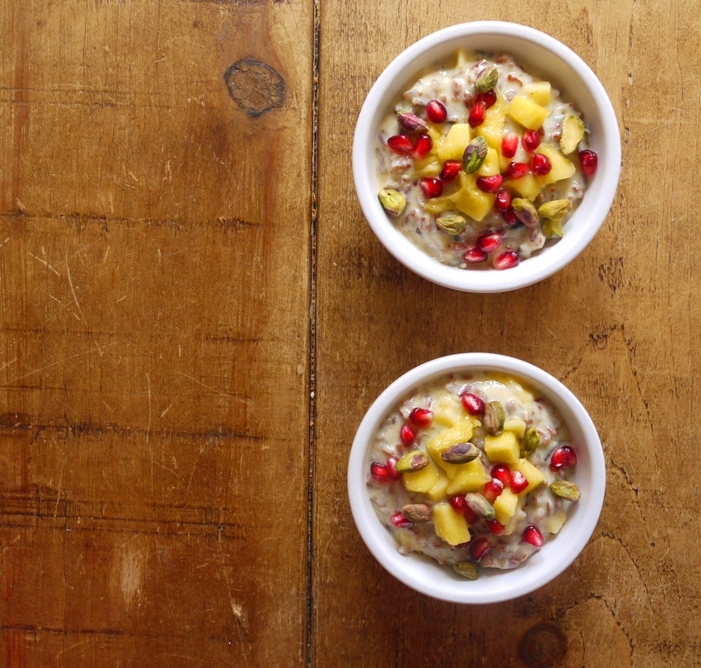 Wild rice is a little firmer and won’t go gloopy like your usual porridge oats or rice pudding, but I think the textures work well with creamy yoghurt and mango, crunchy nuts and the occasional pop from a pomegranate seed. While this recipe is a little more involved and refined than that memorable mango eating experience so many years ago, it’s every bit as in touch with fresh, fruity flavour. If you’re looking for a way to inject a little sunshine into your breakfast, do give these gorgeous bowls a go. You could even let a little bit dribble down your chin for that truly authentic bus experience. If you must. Soak the rice in cold water for at least an hour. Rinse thoroughly under cold running water then place in a pan along with the cardamom and star anise, cover with the coconut milk and 50ml water and bring to the boil. Reduce heat, cover the pan and simmer the rice for about 35 minutes minutes or just until the kernels puff open. Uncover, fluff with a fork and simmer an additional five minutes. Remove from the heat, drain off any excess liquid and pick out the cardamom and star anise. Set aside to cool completely. In a blender, blitz one of the mangoes to a purée. Chop the other mango into bite-sized pieces. Stir the mango purée and pieces into your cooled rice along with the lime zest and natural yoghurt. Divide into four small bowls or containers – at this point you can serve immediately or leave in the fridge overnight. When ready to serve, set a small pan over a medium heat and toast your dessicated coconut flakes until lightly golden. Roughly chop the pistachios. 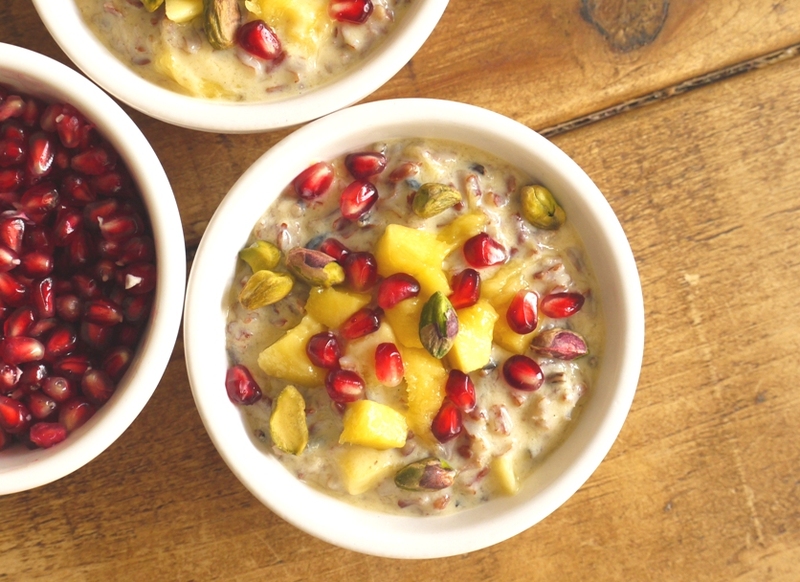 Sprinkle the dessicated coconut, pistachios and pomegranate seeds over your wild rice bowls and serve. It looks fabulous – beautiful colours and very sunny. Alas no mangoes in this corner of the world for five months or so but you’re right locally grown mangoes, ripened in the sun certainly take some beating. Yuuum! Apart from the yoghurt, that is…I might have to see if I can recreate this without. Mango is my favourite fruit, and I really love wild rice, but I usually put the two together in savoury salads. You’ve inspired me! Great photos too – so colourful. I love how bright and vibrant this is – what a perfect way to start the day! I just enjoyed a frozen mango, avocado and cocnut milk smoothie with chia seeds!! On the same track, but this looks fabulous. When my parents went to South Amercia, my mother came back with an obsession for quinoa ! My daughter attended preschool under a large mango tree, or so it seemed when the mangoes were ripe, and it was imperative to be mindful of what was above you when walking from the car to the building at drop off or pick up time. The flavor of a fresh mango (no, I didn’t lick the juices off the ones that smashed to the ground near me) really is amazing and hard to duplicate with well-travelled mango. I’ve never had wild rice in a breakfast/sweet dish, and look forward to trying this. What a wonderful (if slightly scary!) story 🙂 enjoy. I´m all for any grain served in a sweet version. Using wild rice is a genius idea Kate! The variations between ripe and not ripe mango here are definitive here too, and you never know till you try it. 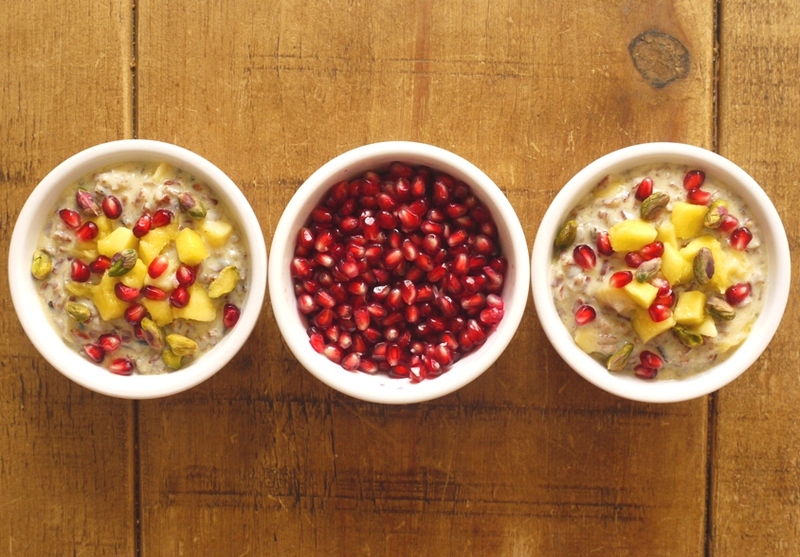 Aren´t pomegranate seeds the brightest way to top a dessert? The texture of the wild rice is a little different to my usual mulchy flake-based breakfasts but I rather like it 🙂 And yes, pomegranate seeds are the best on breakfast or dessert! little loaf, i love the colours. i come from pakistan where mangoes are deemed to be king of the summer season. i am sad to have missed eating them this year by a narrow window. i just came back! but i’ll be looking for the egg yolk yellow ones that are stocked by a local shop. and if i survived being eaten over the sink i’ll definitely give this a go! I haven’t tried wild rice with these spices and fruits. It looks wonderful! I look forward to trying it when mangoes are in season. Alphonso mangoes are in season from April – June so you should be able to pick some up right now! Oh, I live in Brisbane, Australia. 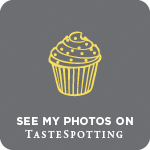 I love summer fruit – I am always a little sad when the summer fruit season is over – so I rely on looking at fabulous photos like yours to keep me going through the winter! Oh what a lovely looking and sounding idea. I agree mangoes here are usually a disappointment and the best one I had was in Africa along with all the tropical fruits. They just tasted unrecognisably good out there. This is the sort of dish that makes you feel good, especially needed on Monday mornings! Oh, I could go for a breakfast like this anytime!!! This breakfast sounds almost as incredible as your adventure! Hi Little Loaf, what beautiful pictures. My mother used to buy a special treat box of bircher muesli to eat on our birthdays. I loved it then- and now you have provided me with a recipe, which I shall certainly try. Thank you! This looks lovely! I am totally obsessed with mangos and even more so after a honeymoon in Vietnam where they just tasted amazing. In fact I had been thinking about making some mango cheesecakes as it was coming up to 2 years since our honeymoon. I’ll definitely have to give this a go for breakfast though. This looks fantastic! I’m going to try this with almond or cashew milk since my daughter is allergic to coconut. What a marvelous breakfast this would make! These colours alone are delicious. I can only imagine how good it tastes! I wish they had better mangoes here in London, though… I’m going to try and recreate this as soon as I step foot in Thailand where mangoes taste like mangoes! I’ve never been to South America but your description – and those mangoes! – remind me so much of the Philippines, where I grew up. 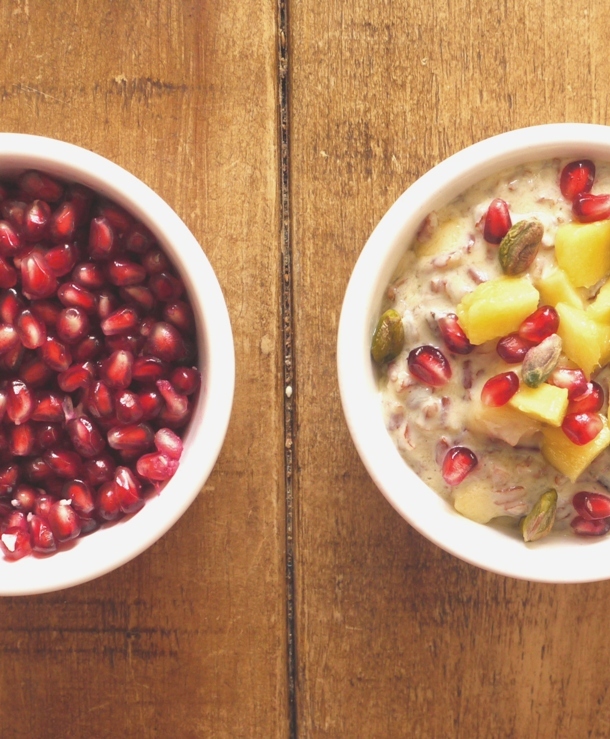 These breakfast bowls look terrific. Now I want to hear more about your bus adventure! What a beautiful and colourful way to start the day. 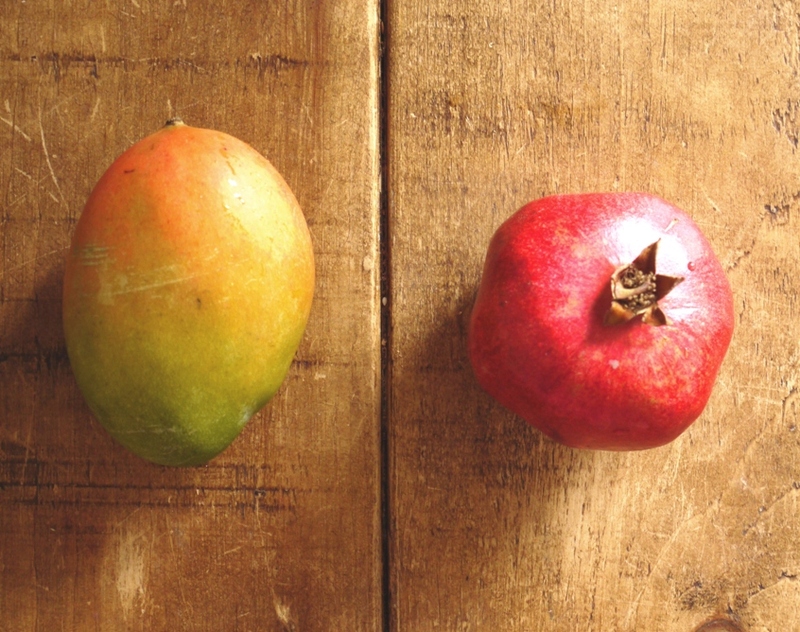 I love your combination of mango and pomegranate. I’ve never tried it but it sounds fantastic! Thanks Jennifer. I love pomegranate in pretty much anything – the juicy pop of each pod is addictive!